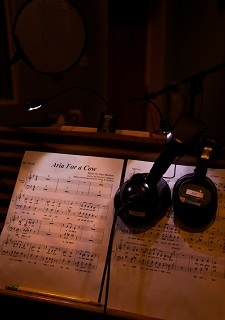 It all started with a team of songwriters and a song about a cow’s need for respect.. The songwriters were no less than Howard Ashman and Alan Menken, who made Broadway history in creating The Little Shop Of Horrors, and film history in creating The Little Mermaid, Beauty And The Beast and Aladdin. But our story starts before that time. They had just written a musical called God Bless You, Mr. Rosewater, and were looking for new projects on which they could work together again. That’s how they came to write some songs intended for Sesame Street. One of them was called Aria For A Cow. But Sesame Street wasn’t interested and Aria For A Cow was packed away. Then, two years ago, an enthusiastic filmmaker and Disney animator came knocking on the doors of Ashman’s estate, looking for a song to animate as a short. 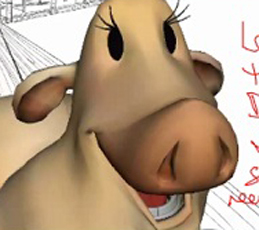 That animator was Daniel James Lund. As an animator at Disney Animation Studios since ’89, he has contributed to dozens of classic features including Beauty And The Beast,and Aladdin, as well as Pocahontas, Lion King, Tarzan, Mulan and Princess And The Frog to name just a few. Recently he served as Effects Design Lead on Disney’s newest musical feature, Frozen. 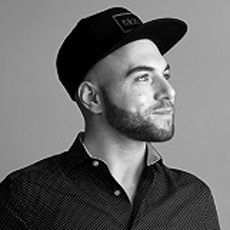 Outside of the studio system, Dan has been very active in bringing non-Disney themed projects from concept to completion including the award winning documentary Death Becomes Them: The Musical (Best Director, New York Film Fest) and Dream On Silly Dreamer (Certificate of Merit, ASIFA Awards). Dan Lund: Every year I go to fill my creative cup, as I call it, in NY. I stay with Leon Joosen, the first Disney director I ever worked for and probably my single biggest “idea supporter”. I can think out loud and he never lets common sense cloud that support. Yes, he challenges the idea to make it all it can be but the idea always gets to live a few moments after it comes out of my mouth. Lucky for Aria, I thought out loud while walking NY streets with Leon Joosen. I had told him I remembered he and the rest of Howard Ashman’s cohorts talking about a passion project of his and its catchy demo. AV: Did you meet him personally? DL: When I started at Disney I was a Production Assistant and although I never met Howard Ashman, I felt I did because everyone around me was associated with him and talked of this project often. AV: And so you searched for that demo. DL: Leon suggested I write to Sarah (Howard’s sister and executor to his estate along with Howard’s companion) [below, along with Dan] and see if anything had come of it. To this day I still don’t know what made me write that email, what made me think I had any right to get personal unpublished info from the sister of Howard Ashman. I often praise Sarah for taking the leap of faith in writing me back. She says she reached out to folks that knew of me back then and I guess I got the thumbs up. Almost immediately she gave me all the breadcrumbs I needed to investigate Howard’s little indie project. All she asked was that I look at another song that had always been her favorite. It was never heard, never sold and for some reason ignored for the past 30 some years… despite her attempts to get it out there as a children’s book. DL: Yes. It was a nothing little song, no demo, no story line and no context but it was fun, charming and as all Howard Ashman and Alan Menkens stuff…catchy catchy catchy! AV: Why did you want your film to be based on a song? AV: The history of cinema is filled with examples of that strong connection between animation and theater. DL: Musical Theater has always been something of an escape. I didn’t study it or participate in it at all during school. I don’t really even know how it works, so when I go to the theater I am a true fan…delighted and innocent. 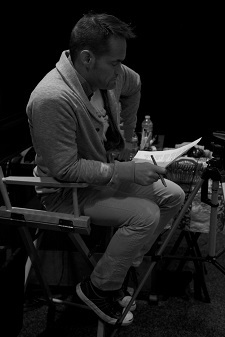 I don’t sit there and try to over critique or think of how “I would have done it”, the way I do when seeing film or TV. I think the theater community is a lot like the animation community in that people get involved first as a fan, but then as almost a keeper of the torch. Both always seem to be almost dying, sometimes they get very “in vogue” but it never lasts longer than a big moment that makes everyone say “they don’t make them like that anymore” and then for some reason…we don’t make them like that anymore. AV: Once Aria For A Cow was chosen as the subject of your project, how did you want to move from there? DL: I didn’t want to just do a music video for the song and felt I needed to prove to Sarah that I had something to bring to the table. Out of respect for this wonderful asset, I wrote a wrap around for Aria. It gave the song context and a point. She liked what I came up with and after warning her again that I had no funding or studio support, I received her blessing and we were off to the races. AV: So, how did the race begin? 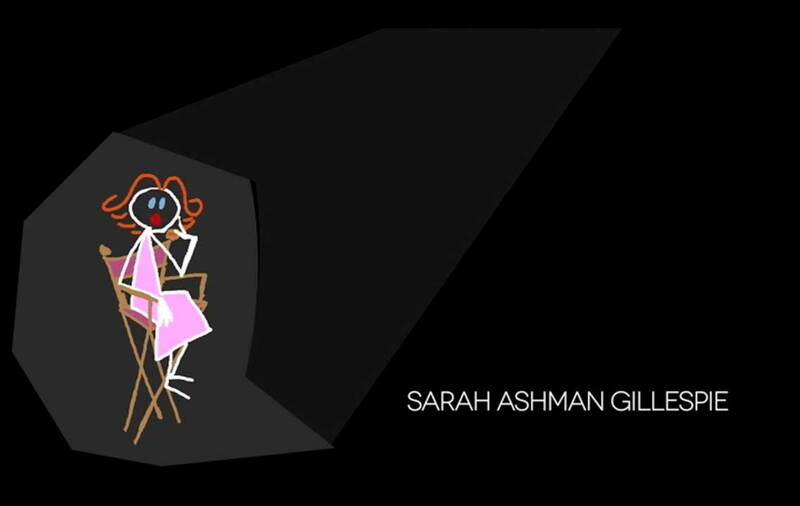 DL: I started out with Leon Joosen doing early art for me in order to give Sarah Ashman something to hang on to. I didn’t want to be another version of Aria that didn’t happen, so with Leon doing art right up front, I felt that Sarah would not just be hearing talk. Leon did many moments from the film. The image that seemed to get the most attention was an Ester-Williams-inspired cream-water ballet. 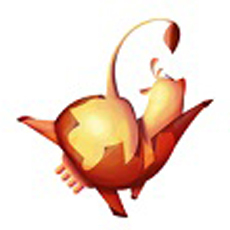 That image always got people giddy and from there we started about 2 years worth of false starts and dead ends. Aria has met and almost tangoed with Disney, Muppets, Rhythm and Hues, Don Hahn, and many, many others. Each version had a different look – puppets, stop motion, paper cut out and mo-cap. Each iteration came with a different team and a different way of funding. By the time the film got to where it is now I almost didn’t care how it looked, I just wanted it to start. When I think of the film I still do not have a finished version in my head. AV: How did you assemble your team? DL: It is really about gathering up people who need the project as much as the project needs them. I look for people who are clever enough to exploit the situation for their benefit, not in a bad way but in that way where they view the production as a gift, something that fills a void in their life, portfolio or career. 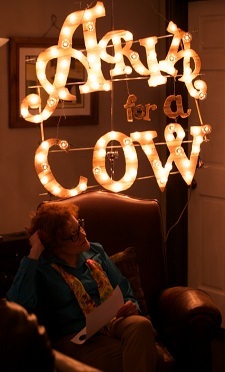 AV: Aria For A Cow is also an educational project. Can you tell me about that aspect of the production? DL: A few years ago I started mentoring a couple of kids. This story can be told from two angles, from them and then from me. I am always flattered when they speak of what they learn from me but I in no way set out to teach. Instead I set out to participate in their creative process. Leading by example is the only way I know how to teach, as I have never taken an animation class before. I know how to make a movie in the most gorilla style and that’s what I can usually offer… my very own elbow grease. AV: What did appealing to students bring to the project, and to you? DL: What I got from them was a new appreciation for being fearless with technology. To see these kids just pick up a program, find a tutorial and apply it to their art just blew me away. If I had one insecurity it’s always been my lack of being able to learn, retain and concentrate. That seems to manifest itself at its worst when I’m trying to learn a new piece of software. I have always made up for this insecurity by making sure I’m selling the “clever” and work ethic more than expected. When I saw these kids jump feet first into the unknown, it made me want to learn and excel in that which scared me. I often joked that I found the fountain of youth or at least a new version of a mid life crisis through not trying to be young but be influenced by them, participate with them and respect their unique “green” point of view on things. In our industry the young are often viewed as a threat or a reason for someone losing his job (younger, cheaper, faster) but the wide eyed excitement that I still feel I have, that I saw in them, was what I now view as the only way to stay creatively fresh. AV: And then your students joined your team as full members of your crew. DL: I recruited Niki (Mannam) and Amos (Sussigan), the students I had been mentoring to take on top tier roles on the film. If we were going to work with other young people, I’d want those new recruits to see how a mentorship done well can pay off. If not a job, at least someone in the industry rooting for you to break in and that can be more valuable than a rockin’ portfolio in my opinion. Amos took on the role of art director and I have been a fan of his since the first day I met him. I knew he was going to go far and I wanted to be there when it happened. He had been having a really bad time at school and with no friends to call his own, I invited him into my social circle as well as any new project I was working on at the time. I like to think that from that moment on we were mentoring each other. The start to his art directing was not a smooth transition. After nursing this project through so many iterations, the last thing I wanted was to be challenged on every idea, old or new. I sent him to New York for two weeks where Leon Joosen and Niki were so they could all do a two-week theater boot camp. It was important to me from day one that the film be 50 percent rooted in theater craft and not just be an animation vehicle. Sarah met up with them, took them to a day of theater and gave them her stamp of approval. AV: Where are you now in the production? 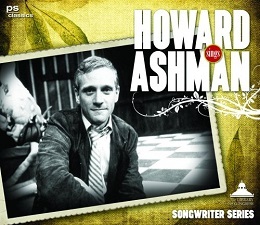 The Howard Sings Ashman CD is available to order from Amazon.com! With our thanks to Dan Lund.